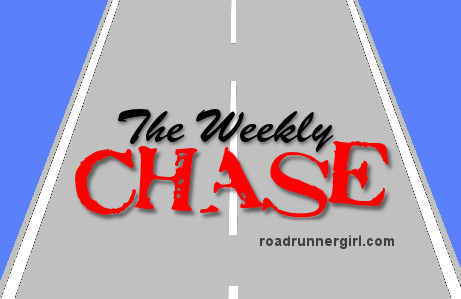 On Tuesdays I link up my Weekly Chase goals with Mindy from Road Runner Girl. I can't believe this is already my 20th! 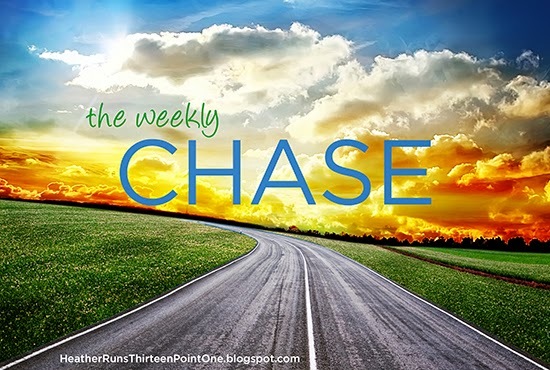 Below is a recap from how the goals from last week went over, and my new goals for this week. I've been doing really well at logging every little thing I eat. I went over my calories by a little bit on Thursday and a good amount on Saturday (I went out to eat with my mom for lunch and then after babysitting I stopped at Taco Bell. Oops). Good every day except Friday. Yes, except for on the weekend - they are my downfall! I've been doing better at snacking healthier things during the workday, though. AHHH! I made it everyday except Saturday. Rats. I know I won't be as good this week, as I've been trying to take it easy to help rest up my knee and hip that have been nagging me. Yep - managed all three run days + three days of cross training with Bar Method classes on Monday, Wednesday, and Friday. Check! I've gotten my Solder Field 10 mile already posted, and another race recap scheduled to go up on Thursday. Yes, though there was still plenty to clean, I did a bunch of laundry, cleaned up the kitchen, and read and commented on blogs. Goal #3 - Foam/stick roll and stretch daily. I'm also going to add in icing my knee to this goal. I ordered a Dr. Cool wrap, so I hope it comes soon so I can use it this week. I'm hoping if I have something as easy to use as that, versus the darn ziplock bags I fill with ice that then leak, I'll be more inclined to ice. I'm going to admit now, that I doubt I'll be doing any icing until that comes... I know, it's horrible, but it's the truth. Goal #4 - Though I weigh myself everyday, I've decided to use Friday's as my official weigh-in days in order to track my gains/losses. Though I am more concerned with building lean muscle and decreasing my body fat percentage, losing a pound by Friday would be a bonus. I'm looking to get down 5 pounds total, and have lost 1 so far. My goal for this week is to be down 1 pound compared to last Friday's weigh-in.